DAWG at the US Social Forum 2010 – Direct Action Welfare Group Inc. 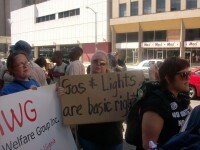 In June 2010, DAWG and Teen DAWG members participated in the 2nd US Social Forum held in Detroit. With the help of our donors we were able to provide transportation and a weeks food and lodging for 2 adults and 3 youth from WV and 1 youth from Baltimore. DAWG co-presented one workshop on the Poverty Initiative and presented a workshop on rural organizing in WV. DAWG was also part of the opening and closing Poverty Summit. Attending the US Social Forum was an experience none of us will forget. While in Detroit, we visited many places in the city and talked with residents to learn about what impact the recession has had. We were surprised at what we saw. Here is a video of some of the things we saw in Detroit. Previous: Previous post: Mountain Health Choices – The End is Near!! Your workshop on rural organizing was great!! I would like to see more from DAWG on your organizing model. The richest country in the world would rather board up a house then let people live in it.